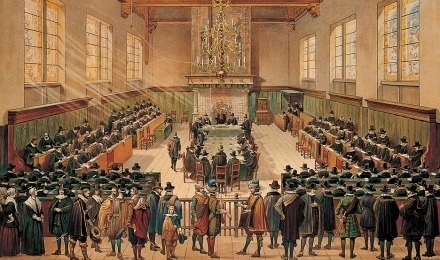 The Theological University of Apeldoorn, the Hersteld Hervormd Seminarium (VU Amsterdam), and the Special Chair of Reformed Theology (University of Groningen) are co-organizing an international academic conference on The Theology of Dort (1618–1619). Confessional Consolidation, Conflictual Contexts, and Continuing Consequences Groningen, May 8–9, 2019. This doctrine [of perseverance] is something which the flesh does not understand, Satan hates, the world ridicules, the ignorant and the hypocrites abuse, and the heretics attack. The Bride of Christ, however, has always loved this doctrine most tenderly and defended it (Canons of Dort 5.15). Harm Goris, Tilburg School of Catholic Theology, Total Depravity or Relapse into Natural State? Roman Catholic Views on the Effects of the Fall. Michael Haykin, Southern Baptist Theological Seminary “Abunde sufficiens ad totius mundi peccata expianda”: Particular Baptists & the Reception of Dort. Arnold Huijgen, Theological University of Apeldoorn, The Lasting Value and Limitations of the Canons of Dort. Volker Leppin, Eberhard Karls University of Tübingen, A Disliked doctrine: Predestination, Dort and the Lutherans. Dolf te Velde, Theological University of Kampen, Justified by Faith? Franciscus Gomarus on the Crucial Issue with Jacob Arminius. Proposal: Title and abstract of 200–400 words. Due date: November 1, 2018. Except for the invited key-note speakers there is no funds for travelling costs and accommodation, but the organizers will provide two lunches and dinners for all those who attend. The costs for participating are € 150. A discount scheme for one or two hotels in Groningen is in preparation.